Minnich and Scotto has designed and managed more than 100 air permitting and monitoring projects in 20 states throughout the country, ranging from comprehensive air quality compliance assessments associated with two $100+ million New York City water pollution control plant (WPCP) upgrades, to detailed Clean Air Act (CAA) compliance assessments in support of the successful permitting of a $400 million New York City cogeneration facility, to designing and managing a continual ambient air monitoring program in support of an 11-month Superfund emergency removal action in Michigan. Below are descriptions of several representative Minnich and Scotto air permitting projects. For those projects which preceded the company, design and management was provided by Timothy Minnich and/or Robert Scotto while employed by another firm. Client: Hazen and Sawyer, P.C. 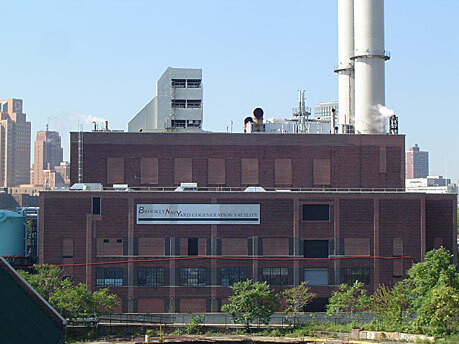 In 1998, Minnich and Scotto was retained by Hazen and Sawyer to provide air quality support in connection with the first of several upgrades of the New York City Department of Environmental Protections (NYCDEPs) Bowery Bay WPCP in Queens, New York. The goals of these upgrades, ongoing today, are to correct a variety of wastewater and sludge process treatment deficiencies. Because we performed all work to the satisfaction of all parties, Minnich and Scotto was retained to provide similar support for each of six subsequent upgrade components. Over this time, our work has involved performance of air quality analyses to procure requisite environmental approvals, and preparation and/or review of associated air permit applications. Comprehensive analyses have been performed for criteria pollutants, HAP and other air toxics, and hydrogen sulfide. The air quality analyses have involved the development of complex emissions inventories and the performance of refined air dispersion modeling. In general, the emissions inventories for HAP and other air toxics were developed using the TOXCHEM+ Model, and the hydrogen sulfide emissions inventories were developed based on an intensive field measurement program employing Jerome meters (Arizona Instruments) to assess source attribution and hot-spot apportionment based on application of the area-source technique. Because refined air dispersion modeling based on initial TOXCHEM+ emissions predictions showed unacceptable offsite chloroform impacts from the aeration tanks, a focused model calibration study was performed for this compound. The calibration study employed the use of three isolation flux chambers to measure chloroform emissions from the particular aeration-tank oxic zone predicted by TOXCHEM+ to have the highest emission rate. Chloroform emissions from other aeration-tank sub-areas were then scaled in accordance with the relative predicted emission rates and re-modeled. In this way, offsite compliance was demonstrated and the need for costly aeration-tank emission controls was eliminated. Of note is the fact that proper simulation of emissions from the open tanks and channels required creation of more than 250 individual sub-areas for modeling. 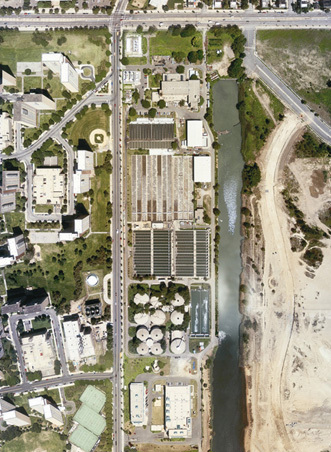 Based largely on the success achieved for the Bowery Bay WPCP (above), Hazen and Sawyer, in 2002, retained Minnich and Scotto to provide similar air quality support in connection with the first of several major upgrades of the NYCDEPs 26th Ward WPCP in Brooklyn, New York. The goals of these upgrades are to correct a variety of wastewater and sludge process treatment deficiencies, as well as to improve the facilitys emergency generator system. Minnich and Scottos work, which continues today, has involved the performance of eight separate air quality analyses to procure all requisite environmental approvals associated with these upgrades. Comprehensive analyses have been performed for criteria pollutants (including PM2.5), HAP and other air toxics, and hydrogen sulfide. The hydrogen sulfide work has included performance of a 9-week, intensive field measurement program to develop a refined emissions inventory in order to support identification of emissions controls to be incorporated into the upgrade itself. Similar to the Bowery Bay WPCP work (above), Jerome meters were used to assess source attribution and hot-spot apportionment. However, for this facility, a substantial improvement to the field methodology was made via the design and implementation of a controlled tracer-gas release program involving optical remote sensing for the direct calculation of the vertical dispersion coefficients used in the model (AERMOD in this case) for emissions back-calculation. Dual tracer gas (carbon tetrafluoride and sulfur hexafluoride) were released at known, constant flow rates from two upwind distances, and a best-fit, second-degree polynomial was created to describe the vertical dispersion (sigma-z) over the downwind region of interest. These curves, each of which provides accurate simulation of the plumes vertical dispersion over the corresponding event period (typically 10 minutes), were then substituted into AERMOD to maximize the accuracy of the emissions estimation.This customization of AERMOD, in essence, allowed the model’s existing dispersion algorithm to be bypassed which greatly reduced the conservatism in the calculated hydrogen sulfide emissions. The most recent analysis is associated with the upgrading of the emergency generator system. A major component of this work includes a facility capping analysis which defined a worst-case, allowable fuel-use scenario to keep the facility from being considered major in terms of its potential to emit (PTE), and which does not result in exceedances of applicable ambient air quality standards or increments. Accordingly, the facility was able to cap out of federal Title V permitting requirements and, thus, be subject to a less-restrictive State Facility Permit by virtue of its status as a synthetic minor source while still being able to generate sufficient power during those times when the local utility company reduces or interrupts electricity to the facility due to excessive regional demand. Daily and annual operating limits were developed for the achievement of compliance with applicable regulations, based on results of the facility capping analysis and refined dispersion modeling (USEPAs new AERMOD Model). Results demonstrated that the facility does not, under the above worst-case fuel-use scenario, cause a contravention of any ambient air quality standard or increment by itself. However, combined modeling of the facility and the Starrett City power plant (the only other significant nearby source) showed exceedances of the standards for nitrogen dioxide, particulate matter, and sulfur dioxide. Further analysis demonstrated that the Starrett City power plant, a grandfathered Title V facility, is nearly wholly responsible for these exceedances. The air quality impact analysis included performance of a comprehensive PM2.5 significant impact analysis following newly developed NYCDEP guidance. 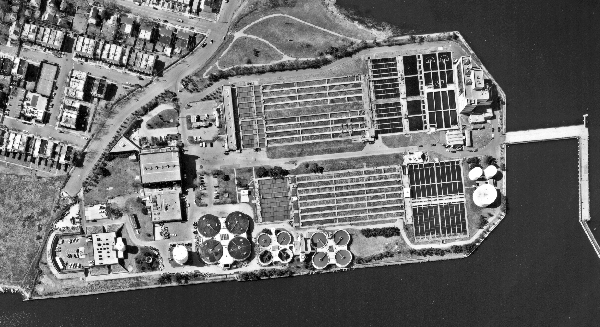 Minnich and Scotto was retained by the URS/AKRF project team in connection with a Phase IV upgrade of the NYCDEP Hunts Point WPCP, Bronx, New York. Work involved the performance of TOXCHEM+ modeling to facilitate evaluation of options being considered to reduce the discharge of dissolved nitrogen from the plant. One such option involved the addition of various biodegradation-enhancing compounds into the wastewater immediately upstream of the aeration tanks, thus increasing the production of nitrates at the expense of the dissolved nitrogen in the plant effluent. Because such activities have the potential to create air quality issues simply by the addition of the compounds themselves to the wastewater stream, we were tasked to evaluate compliance with emission limits for HAP and VOCs, and with maximum allowable offsite concentrations for those compounds regulated by the New York State Department of Environmental Conservation (NYSDEC). Minnich and Scotto was retained by the BBL/EarthTech project team in connection with an upgrade of several process sources at the NYCDEPs Tallman Island WPCP, Queens, New York. Work involved a comprehensive assessment of HAP and other air toxics regulated by the NYSDEC . The TOXCHEM+ Model was applied to a total 179 individual area sources and 3 point sources to properly simulate the process emissions. Regulatory applicability was assessed via tabulation of compound emissions, and the ISCST3 Model was applied to assess compliance with 24-hour and annual NYSDEC offsite standards. Annual standards were exceeded for chloroform, 1,4-dichlorobenzene, and tetrachloroethene. However, because none of these exceedances was greater than 10 times its respective standard and pursuant to NYSDEC regulations for carcinogens, we performed a BACT analysis to demonstrate the economic infeasibility of controlling emissions to the degree necessary to achieve full compliance. As such, BACT for this plant was defined as no control, and further control of air toxics was not required. Results of this work were used by the project team and the NYCDEP to support the final design of the upgrade. Client: Metcalf & Eddy of New York, Inc.
Minnich and Scotto completed all necessary pre-construction air quality analyses to support permit procurement for a state-of-the-art floating 28.5 megawatt cogeneration facility to be permanently moored to a pier in the East River. Eventually halted due to local Community opposition, this facility would have provided steam to three Brooklyn housing projects. Minnich and Scotto worked closely with the design engineers to ensure that facility was not defined as a major source, and that the delicate balance between facility engineering decisions and permit procurement time was maintained while ensuring that power supply contractual provisions were not jeopardized. Minnich and Scotto completed procurement of a facility air permit, in accordance with requirements set forth under Title V of the Clean Air Act, for the GMD Shipyard in the Brooklyn Navy Yard. The shipyard performs ship repair and underside restoration and coating, and generates a significant quantity of volatile organic compounds (VOCs), particulate matter, and hazardous air pollutants (HAP). The facility permit application was prepared in conformance with the 6 NYCRR Part 201 regulations, as revised on March 20, 1996. Minnich and Scotto completed all necessary pre-construction air permitting in support of a major source, gas-fired cogeneration facility in the Brooklyn Navy Yard in Brooklyn, New York (see photo at the top of this page). All analyses were performed in accordance with the then-proposed revisions of the New York SIP and provisions of the New York State Environmental Quality Review Regulations as promulgated by the New York State Uniform Procedures Act. A significant accomplishment was the procurement of the required NAA and PSD Permits to Construct within 7 months of application submittal. Work involved demonstration of appropriate pollution controls pursuant to NAA and PSD regulations and identification of available emissions offsets for nonattainment pollutants. BACT engineering analyses were performed for SO2 and PM10, and engineering analyses for oxides of nitrogen, VOCs, and CO. Because the performance on this project was recognized as exceptional, the submittal package was identified by the NYSDEC as a Benchmark Permit, toward which other applicants are directed. Minnich and Scotto performed a comprehensive, expedited technical review of a Focused Field Investigation (FFI) report which was prepared by EnSafe/Allen & Hoshall under its Navy CLEAN Contract. The review addressed the air quality issues associated with a $1 million soil, groundwater, and indoor air study to assess contaminant migration through the vadose zone and into several buildings at Naval Base Charleston. Because results of the FFI are potentially subject to litigation, Minnich and Scotto was requested by the client to perform a comprehensive examination of all air-related aspects of the FFI. We were able to complete this review within 3 weeks and provide the information to USEPA Region 4 to demonstrate the technical validity of the investigation. 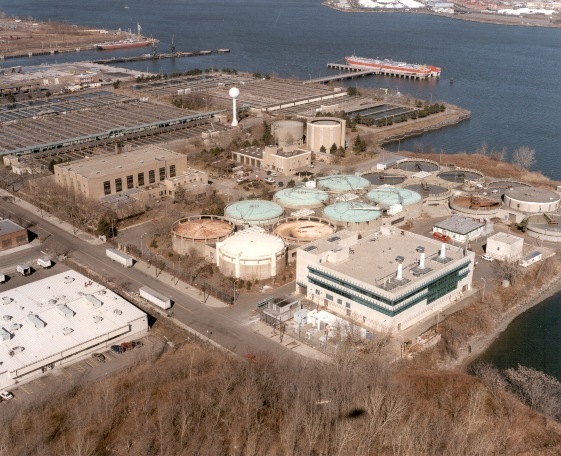 Minnich and Scotto designed and managed a comprehensive air permitting study in support of a project to repower the existing Warbasse Cogeneration Facility in Brooklyn, New York. Analyses were performed to demonstrate compliance with state and federal requirements (NSR, NAA, and PSD) as they apply to existing major NOx sources and with the City of New Yorks Environmental Quality Review process. We also managed all phases of the CEM system procurement effort, including vendor selection and oversight. Client: Vermont Integrated Waste Solutions, Inc.
Minnich and Scotto performed a comprehensive engineering and permitting assessment of the Rutland Resource Recovery Facility to address a variety of solid waste and air toxics issues as required under Vermonts 1987 Solid Waste Act (Act 78) and its Air Pollution Control Regulation 5-261 (Control of Hazardous Air Contaminants). A detailed review of 26 other mass-burn, energy-recovery municipal solid waste (MSW) incinerators which have come on-line in the US and Europe since 1985 was conducted for a total of 7 contaminants for which facility emission rates were demonstrated as exceeding specified thresholds (action levels). Stack test data were evaluated to determine the lowest emission rate achieved for each contaminant of concern. These emission rates were used to establish a Hazardous Most Stringent Emission Rate (HMSER) for that category of source. A top-down BACT analysis was conducted to identify and evaluate several alternate control technologies to reduce facility emissions to the lowest permitted level in practice. Refined air dispersion modeling was also performed. All work was conducted in close cooperation with the Vermont Agency of Natural Resources (ANR). Minnich and Scotto performed an air quality impact analysis to evaluate hydrogen sulfide and ammonia emission control efficiencies in support of an Application for a Permit to Construct for a proposed dewatering facility at the Joint Treatment Plant in Yonkers, New York. Odor impacts were assessed with respect to established NYSDEC ambient concentrations which may be associated with the occurrence of nuisance odors. All analyses were conducted in accordance with the NYSDEC Air Guide-1. © 2007 Minnich and Scotto, Inc.